Sandwiched between Halloween and Christmas, Thanksgiving is usually given short shrift by collectors. Halloween has witches, ghosts, ghouls, black cats, and Jack-o-lanterns. Christmas has nutcrackers, ornaments, reindeer, lights, and Santa Claus. And what has Thanksgiving got? Actually, the turkey - wild, not domestic - is an admirable bird. While Ben Franklin never formally suggested making the turkey our national bird, he did regard it as a much more courageous fowl than the bald eagle. Its somewhat unexciting appearance, however, places it at a disadvantage in the collectibles market. Who's cuter: Rudolf the Red-Nosed Reindeer or Tom Turkey? We rest our case. It is unknown whether turkey was on the menu at the first Thanksgiving in 1621, but it had become so associated with the feast that by the time President Lincoln proclaimed Thanksgiving a national holiday in 1863, the bird had become the holiday's universal symbol. By 1870, English transferware makers were manufacturing plates and platters with Thanksgiving motifs for export to the growing American market. Romanticized depictions of Pilgrims, Native Americas, and - yes - turkeys were soon gracing holiday tables everywhere. Spode, Royal Doulton, and Wedgwood are but three of the more notable makers of Thanksgiving-themed transferware, including flow blue patterns. Like most transferware of the late-19th and early 20th centuries, especially nice pieces can sell for up to $1200 and more. 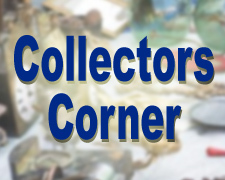 Of course, not many collectors have both the space and the means to amass a collection of turkey platters. (Remember: some pieces are large enough to hold a 24-pound bird!) Luckily, there are other Thanksgiving collectibles that appeal to both niche and cross collectors mindful of their budgets. Thanksgiving postcards, especially from the Victorian period up to the 1950s, are particularly popular, as are Thanksgiving-themed salt and pepper shakers, and vintage paper decorations. Most items in these categories can be acquired for less than $25, many times for just a dollar or two. And if you are reading this after the holiday, prices could be falling on everything - even platters - as everyone sets their sites on the more popular Christmas collectibles. So this may be a good time to add a coveted piece or two to your collection. Affordable Collectibles: Thanksgiving Greeting Postcards - Thinking about starting your own collection? Check out this article by Pamela Wiggins for some of the basics. Nancy's Daily Dish: Talking Turkey...and Transferware - Wonderfully illustrated look at turkey platters. (And you thought they were all white!) For more photos and information, check out Nancy Robert's History of Turkey Transferware. Vintage Thanksgiving Postcards - Nice overview with lots of photos!